Despite the many pathways to deterioration, there are a number of effective preservation methods that have evolved to combat spoilage. A principle tenant of food preservation is to maintain the quality and nutritional attributes while preventing spoilage. In general, the fresher the juice, the higher the quality, so the standard of excellence is often freshly prepared, unprocessed juice (Sizer and Balasubramanian, 1999). As indicated, this is a very transitory product having a limited shelf life of hours or days even under the best of circumstances. Two practical "processes" capable of extending storage are rigorous attention to good sanitation from production through juice preparation and low temperature holding. Even in the absence of pathogenic microbes, the natural microflora present will be active. The microbial load can be appreciably reduced by good handling and sanitary practices, but not eliminated. A holding temperature as close to the juice freezing point as possible (-1 to -3ºC, depending on soluble solids), combined with efficient preparation and exceptional sanitation in preparation and packaging can extend storage life up to a month. Several accompanying difficulties are the possibility of other quality-reducing reactions comprising enzymatic, oxidative and the challenge of maintaining minimum refrigeration temperature throughout distribution, including in the consumer's refrigerator. Going from an exceptionally low refrigeration temperature to a merely good one (2ºC to 5ºC) can reduce shelf life from greater than a month to less than 3 weeks. One rule of thumb specifies each 10ºC increase in temperature roughly doubles reaction rates. Refrigeration combined with pasteurization and hermetic packaging can further increase storage life with minimum quality changes, but then the juice cannot be labelled "fresh". Thermal processing does away with the absolute need for refrigeration and inactivates enzymes. But heat-induced reactions change the character of the juice. With many juices heat is tolerable and commercially acceptable packs are available. However, there are some delicate-flavoured juices, most of tropical origin, that cannot tolerate even the most gentle pasteurization step. A major quality defect in pasteurized tropical juices and juice beverages is over heating or holding the product at too high a temperature before or after pasteurization. The resulting scorched flavour and colour does not do justice to the fruit so treated, easily reduces consumer appeal and destroys market potential. All preservation methods that allow juice storage above refrigeration temperatures, greater than about 5ºC, are limited by Maillard browning and other slow but persistent reactions. 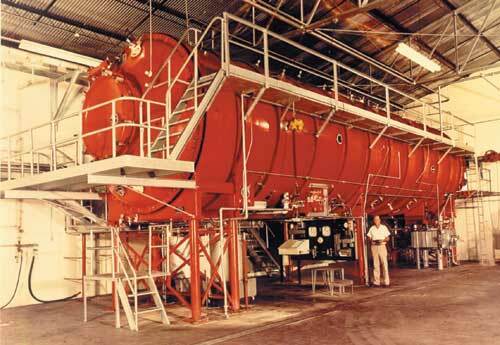 Thus low temperature during manufacture and storage is a valuable hurdle to deterioration. Single strength juice freezing and storage in a low oxygen environment can maintain fresh character as well or better than any other process. However, it is a costly alternative and appropriate only where product value merits freezing and holding large volumes of single strength juice. Slow deterioration (over months) is exhibited by decline in nutrients , primarily loss of ascorbic acid, enzymatic activity as well as flavour, colour and viscosity changes. For frozen products, the closer to thawing temperature they become, the faster these reactions occur. Although the product cannot be labelled as such, subsequent thawing and proper packaging approximate fresh juice. "Fresh frozen" is the appropriate designation. The thawed juice then has a shelf life limited by sanitary conditions and pre-freezing treatments. In circumstances where thermal processing is impractical, minimal processing employing hurdles is called for. The hurdle principle is based on the premise that while any single barrier to microbial growth may be inadequate for desired protection, a number of barriers together can enhance product stability (Figure 8.1). Thus good sanitation is the first barrier to reduce microbial load; low storage temperature further retards growth. An acid environment of pH less than 4.5 (ideally less than 3.5) restricts the growth of many organisms. 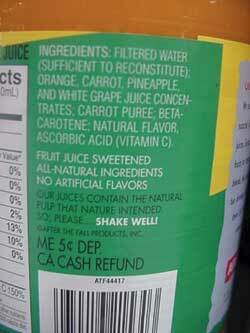 Fortunately most juices are acid, or amenable to acidification. The exclusion of oxygen is an additional barrier. (Although anaerobic conditions are dangerous with low acid foods and can even set the stage in high acid products for anaerobic spoilage organisms, i.e. yeast, lactic acid bacteria, etc.) Antimicrobial substances, either natural or chemical preservatives, also assist. Proper use of hurdles can appreciably lengthen shelf life of unpasteurized juices without unduly affecting quality. Minimal processing is the strategy by which a number of hurdles are combined to effect near "fresh" juice characteristics. 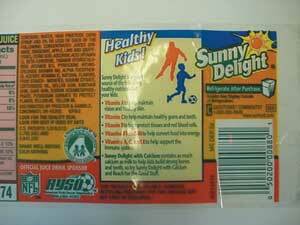 Although the sensory quality may approximate that of the unprocessed product, the term "fresh" cannot be used. The ubiquitous network of refrigerated and frozen production, storage and transportation facilities, including home units, encourages minimal processed juice products. Thus, even the slightly less fresh flavour exhibited by pasteurized juice is not acceptable to some. In developed countries fresh squeezed, refrigerated juices continue to capture sales from frozen concentrates despite a substantially higher price and shorter shelf life (Table 8.1, Figure 8.2). Convenience and the closer-to-natural image apparently justify the 30 to 50 percent price premium and bulky storage requirements of these ~85 percent water drinks. 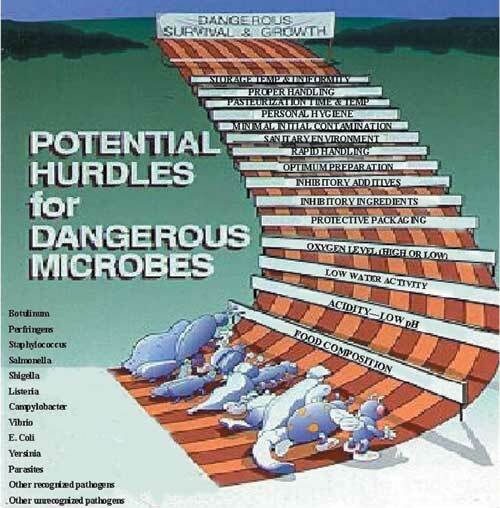 Figure 8.1: Hurdles to microbial growth. Table 8.1: Advantages and disadvantages of "Fresh" = Minimally processed juice. A conceptually appealing process (actually a hurdle) is the inclusion of benign microorganisms into a food. These microbes, designed to grow well under conditions of storage abuse including temperature, oxygen level, pH, water activity, etc., will dominate spoilage and readily signal their presence thus harmlessly causing rejection of the spoiled item. In some cases competitive growth produces substances inhibitory to dangerous organisms, or affects a desirable chance in the food such as cheese ripening, alcohol production and lactic acid and flavour development. Figure 8.2: Chilled juice aisle. 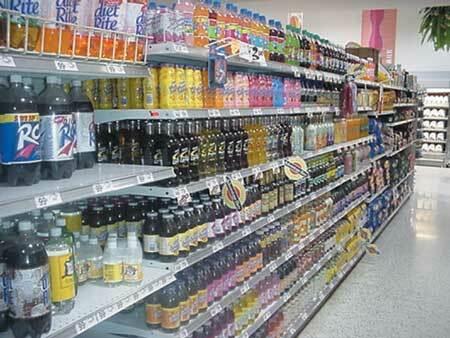 Single strength beverages requiring refrigeration throughout the distribution chain. Indeed, the development of these fermented foods served to stabilize and improve the original materials. Taking the concept one step up the food chain suggests that competitive inhibition can be used to combat pathogens in food borne disease vectors i.e. insect droppings, animal manure/intestine and even in the human body. Just as vaccination employing modified pathogens or their derivatives dramatically reduced infectious diseases, genetically modified organisms with tailored growth/inhibition characteristics will eventually protect minimally processed foods. The acid nature of most juices permits pasteurization, defined as the use of temperatures near 100ºC to effect destruction of spoilage organisms. Although spores conceivably can survive at a pH less than 4.6, outgrowth is unlikely. In contrast, at a pH greater than 4.6, spore heat resistance dictates a process temperature of greater than 115ºC for an extended time. Hence pH reduction by acid addition to turn low acid or marginal pH juices into high acid products is widely practiced. A potentially effective process for fresh juice involves heating clean, well-sorted whole fruit for up to 1 minute at 80ºC. This greatly reduces surface contamination without influencing the underlying flesh that, if juiced in a sanitary manner, has the sensory quality of fresh juice. A great deal of research is underway combining surface heat with other decontamination practices. Whether these treatments will qualify as producing "fresh" juice for labelling purposes remains to be seen. Standard canning procedures specify filling cans or jars with hot juice (~70 to 80ºC), sealing and processing at 100 to 105ºC for up to 10 minutes and cooling immediately. This is rarely done in a still (stationary or motionless) retort, since slow heating and cooling would ruin the quality. Instead, a continuous rotary retort provides rapid heating and cooling as a result of the juice being stirred inside the can by the headspace bubble movement during rotation (Figure 8.3). Another rapid system is the spin cooker/cooler where the spinning action provides good internal and external surface contact. Figure 8.3: Rotary retort and schematic. It is fairly easy to hot fill pack juices by rapidly heating the juice in a heat exchanger and filling containers with the hot juice measuring around 95ºC followed by sealing and inverting, thus pasteurizing the container (Section 11.5). Reasonably rapid cooling is accomplished by rotary or spin action. This is known as flash pasteurization and can be achieved almost instantaneously. However, once in a container, cooling cannot be as rapid. The major quality problem is scorching, due to holding the juice hot, either before or after filling. 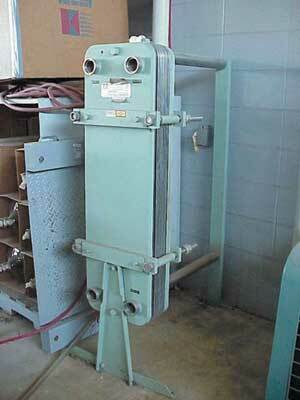 Many types of heat exchangers are used. The simplest is a coil submerged in boiling water with the juice flow adjusted to the desired pasteurization temperature (Figure 11.14, Chapter 11). For pulp-containing juices or those likely to leave a film on the heating surface, a swept surface unit can continuously heat a juice stream. A plate heat exchanger with a regeneration section by which the cool entering product is preheated by the exiting hot product stream can be quite energy efficient, although the cooled stream must then be handled, filled and sealed in a sterile environment (Figure 8.5 aseptic processing). Figure 8.4: Pilot aseptic line. Swept surface heat exchanger on right. Figure 8.5: Plate heat exchanger. Hot fill has the additional advantages of driving air from the juice and ensuring a partial vacuum in the sealed container as vapour condenses upon cooling. 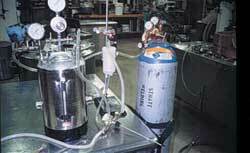 Of course, deaeration and use of an inert gas during packaging are also useful. Sanitation is quite critical, since there are acid resistant moulds such as Bysochalmous fulva and Talarmyces flavus with unusually high temperature tolerance that require temperatures close to 100ºC for up to 60 seconds for adequate pasteurization (Ashurst, 1995; Splittstoeser, Somogyi, et al., 1996a). Such a process could be excessive for some delicate-flavoured juices, thus requiring either gentler processes or exceptionally sanitary preparation. These moulds are not too common, but once established in a processing facility, they are difficult to eliminate. A more elegant aseptic system rapidly heats, holds the hot juice to implement pasteurization and cools the juice before filling into sterile laminated paper/plastic/foil containers which are literally formed around a cylinder of flowing sterile juice (Figure 8.6, Tetra Pak, 2000). The rapid heating and cooling of the product guarantees microbial and enzyme destruction. A major advantage of aseptic packs is its adaptability to many size containers from single serving 200 ml portions to thousands of litre bulk packs. It is absolutely essential to pasteurize or in some cases sterilize the product, cool adequately and pack into sterile containers in a sterile environment, since the presence of a single viable organism can spoil an entire lot of juice. The evolution from simple canning to aseptic processing has greatly improved processed juice quality, but at a price. Aseptic systems cost more than US$1 000 000 and require sophisticated control and maintenance. Figure 8.6: Aseptic package formation and multiple lines. Another gentle and effective preservation method is sterile filtration. Clarified juice can be passed though a membrane filter with uniform pore size of less than 0.2 microns, thereby physically removing all microorganisms and virus (Figure 8.7). Of course, down stream sterility and aseptic packaging are essential and membrane leakage is disastrous. However, such juices have long storage potential provided endogenous enzymes are not active and reasonably low temperature storage is maintained. Juice where a cloud is normal or one that throws down a precipitate or forms a haze after filtration cannot be so treated. Experimental systems that separate the juice into a clear liquid, for sterile filtration and a pasteurized cloud portion then homogenizing and combining the sterile streams can be developed. Similarly, one strategy for juices containing considerable pulp is to separate pulp from fluid juice, process the juice rapidly in a heat exchanger and the pulp by slower means. The two streams are combined with homogenization to stabilize the blend and then packaged, all under aseptic conditions. Figure 8.7: Pilot scale sterile filtration units. Building on the hurdle principle, antimicrobials can effectively extend shelf life (Table 8.2; Maga and Tu, 1994). Sulphur dioxide is quite effective in inhibiting both microbial growth and enzymatic and non-enzymatic browning and is standard practice in most wine making. A small number of individuals are quite sensitive to SO2, so correct labelling and minimum levels are required. SO2 is delivered as the gas or in the less noxious and more easily controlled form as potassium metabisulphite with about 60 percent by weight as SO2. Dosage is reasonably self-limiting, since too little is ineffective and too much gives an unpleasant, pungent aroma. The preservative action is due to the undissociated H2SO3 molecule (formed when SO2 or bisulphites are dissolved in water), so lower pH favours its use, as graphically illustrated in Figure 8.8. Levels of 30 to 100 ppms, at a pH below 4.0 are effective. However, some asthmatics are so sensitive that simply being near SO2 solutions is enough to trigger an adverse reaction, so caution is advised in use and labelling in foods if over 10 ppms is mandatory. Figure 8.8: Relationship between sulphurous acid ionization and pH. Table 8.2: Common juice preservatives and additives. Other preservatives such as benzoic acid, sorbic acid and to a lesser extent, CO2 can be used individually or synergistically. Sodium benzoate and potassium sorbate are the preferred forms given greater solubility of the salts (Branen, et al., 1989). Both function best below pH 4.0. U.S. Federal regulations limit benzoates to 0.1 percent and they are most effective against yeast and mould. Sorbic acid is effective over a broader range, up to pH 6.5. Benzoates and sorbates are often used together in combination with low temperatures to extend the shelf life of minimally processed juice drinks (Somogyi, et al., 1996a). Although both sorbates and benzoates exist in nature, these so-called "chemical preservatives" are currently out of favour due to consumer misperceptions regarding their safety and the trend toward selecting "all natural" products. The term "no preservatives added" has the false connotation of improved quality. In reality, proper use of such preservatives can benefit safety and quality and prevent much waste, but is a hard sell in the marketplace. There continues to be misuse of preservatives by some processors. Benzoates in particular are overused. Some pasteurized juices have a biting aftertaste due to excessive benzoate. 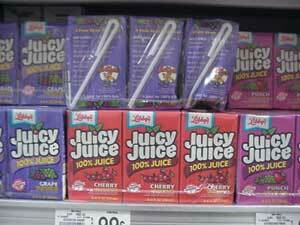 The overuse is not harmful, but ironically completely unnecessary in adequately pasteurized juice. The philosophy "if a little is good, more is better" has no place in food processing. Under no circumstances should any preservative be a substitute for sanitary practices. Preservatives are only one of several hurdles that can be used to maintain quality and extend shelf life (Figure 8.1). A preservation method that has been alluded to previously is alcoholic fermentation. This will be dealt with as a by-product, although in most cases it is the primary product. Winemaking is now far removed from simply "letting Nature take its course" by which naturally occurring wild yeast convert fruit sugars to alcohol. Low levels of ethanol represent another hurdle and levels of over 7 to 10 percent by volume partially inhibit other spoilage organisms. The addition of alcohol up to about 18 percent is a reasonably effective antimicrobial preservative, although the character of the juice is dramatically altered. Oxidation and other types of deterioration can still occur. Weak fruit wine at about 6 percent alcohol is the starting point for the acetic acid fermentation and the manufacture of vinegar, which represents a value-added by-product of fruit juices. Under unsanitary conditions and in the presence of air, spoilt juice or wine can slowly turn to vinegar due to acetobacter contamination. And vinegar itself is a useful pH-reducing hurdle, although associated more with acidified vegetable products than fruits. However, gross contamination of fruit juice is apt to result in a vile mixed fermentation with moulds growing on the surface, producing visible growth and a range of noxious organic chemicals, perhaps aflatoxins, with alcohol being produced at the bottom. How producers up until a century ago consistently got palatable wine or even vinegar from such natural fermentations is a tribute to their pre technology skills. Unless fruit juices are handled with extreme care for fresh consumption or gently thermal processed and stored at moderate temperature, flavour suffers. There are a number of evolving preservation methods applicable to juice that do not require heat (Hoover, 1997). For the most part these are experimental with processing details still under investigation. The cost of processing equipment and present engineering limits to continuous, high throughput systems are barriers not yet overcome. Nevertheless, the promise of shelf stable juices with freshly prepared characteristics is adequate incentive, so commercial systems will eventually evolve. A few approaches summarized in Table 8.3 are mentioned here. Table 8.3: Some newer juice processing methods. Subjecting juice to extremely high pressure in the order of hundreds of megapascals (thousands of atmospheres, 101.3 kPa=1 atmosphere) can destroy vegetative cells and some spores. Enzyme inactivation requires even higher pressures or longer exposure times, but relative stabilization can be achieved. Rapid pressurization cycles demand veryrugged, expensive equipment. Although continuous systems for liquids are under development, initial use will be applied to high value products. High pressure using CO2 provides the additional stress of reduced pH (by the formation of carbonic acid, which is eliminated by depressurization). In this case, lower pressures (~100 MPa) can accomplish greater microbial destruction and enzyme inactivation than higher pressures alone. High voltage potential maintained in a flow chamber can pasteurize juice at only moderately elevated temperatures. However, enzyme activity is reduced to a much lesser extent than vegetative cells. Magnetic fields are somewhat effective against microorganisms and easier to apply to fluids, but these are still in the preliminary experimental phase. A thin film of reasonably transparent juice can be subjected to intense light irradiation ranging from ultra-violet through near infrared as a pasteurization step. Such a process is practical only for water and clear juices. Shelf life can be extended provided that flow is uniform, no blocking particles interfere and the product is deaerated prior to treatment and refrigerated rapidly afterward. 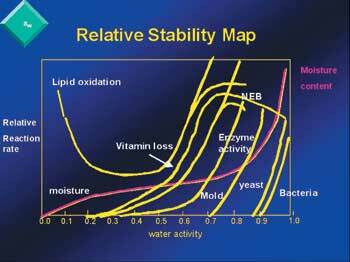 However, enzyme activity is not affected appreciably. Ionizing irradiation has long been practical to extend the shelf life of fresh fruits. The process can be applied in juice manufacture by either irradiating the fruit prior to extraction or treating the juice. Although juice enzymes are quite resistant to irradiation, elimination of pathogens is accomplished by reasonably low doses in the order of 0.2 to 0.5 kGy (Thayer and Rajkowski, 1999). Interestingly, irradiation long scorned by technophobes with little understanding of radiation chemistry, is an effective way of safely maintaining fresh juice quality under refrigeration. Although the products must be identified as having been irradiated through the display of the international symbol the Radura, it should be popular as a safe alternative to thermal processing. Irradiation may have the more immediate use as a whole fruit surface pasteurization step prior to juicing. As an insect disinfestation process in whole fruit, it is unparalleled. There are a number of liquid concentration systems applicable to juice (Table 8.4). Open atmosphere concentration of juices has long been practiced; simply boiling off water is at the expense of product quality due to heat damage. The process that has been most responsible for the wide availability, economy and popularity of fruit juices is vacuum concentration. Post war developments in the United States of America dramatically increased the demand for frozen concentrate, primarily citrus (orange and grapefruit), grape, apple and pineapple. Energy efficient multi-effect systems with essence recovery systems are widespread in major juice processing regions globally (Chapters 11 and 12) . The application of vacuum concentration reduces the boiling point of juice and, when combined with short exposure to high evaporation temperatures, reduces heat damage. Process developments led to multiple effect low temperature evaporators operating at a maximum temperature of 50ºC (vacuum of ~ 40 KPascals, depending upon soluble solids). High thermal efficiency is achieved by using the vapour from the first effect as the heating media in the second effect and so on (Figure 8.9). However, enzyme activity required pasteurization at ~90ºC. The thermally accelerated short time evaporation (TASTE) system that combined enzyme activation at around 100ºC for several seconds improved concentrate quality at high throughput (Chen in Nagy, 1993). Essence recovery from vapour from the first effect further advanced concentrate technology and is found in many industrial units (Figure 8.10). Table 8.4: Juice concentration systems. Since vacuum concentration strips the natural aroma from the juice, quality suffered. An initial solution with citrus was to over concentrate the juice to about 55ºBrix and add back about 43 percent of fresh, high quality single strength juice to obtain 42ºBrix and provide aroma. Essence recovery and add back was an improved solution. Although in the absence of recovered essence, juice added back is an effective solution. Water removal as affected by concentration greatly simplifies juice handling, storage and shipping logistics. Some juices can be concentrated to over 70ºBrix, thereby increasing the juice solid up to 10 fold (Crandall, et al., 1981; Fox, 1994). High Brix is limited by viscosity build up due to the presence of pectin substances and insoluble solids or pulp. In the concentrated and frozen or refrigerated form the juice can be held for extended periods, shipped, or stockpiled for future use. Indeed, the global trade in frozen concentrate has profoundly influenced juice and juice beverage developments, since long term stability and ease of transport make concentrates a readily available commodity. Concentrates must be maintained cool, if not frozen to prevent quality loss primarily Maillard browning type reactions affecting colour and flavour. However, shelf stable concentrates (100 percent juice and ~25 percent juice drinks) of about 50ºBrix are found in retail trade under conditions of good inventory control (Figure 8.10). 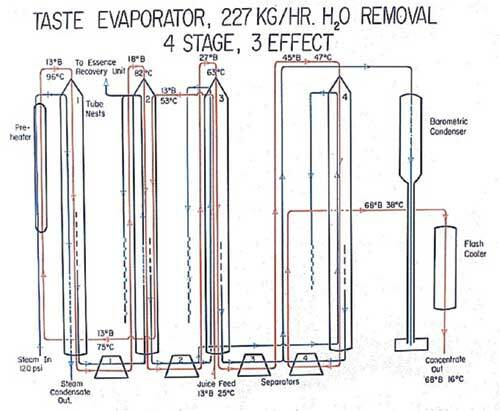 Figure 8.9: Essence recovery system schematic and commercial TASTE evaporator. Commercial units range to 20kL water/hr. Figure 8.10: Unfrozen juice concentrates. Three can volumes of water added for reconstitution. A considerable amount of fruit juice, puree, pulps and pieces are devoted to jellies and jams. Standard jelly or jam manufacture requires a minimum of 45 percent by weight fruit juice, pulp or pieces, sufficient pectin to set the gel and acid to reduce the pH to ~3.1. Low temperature storage, less than 30ºC. Although the combination of low pH, high solids and hot fill eliminates microbial spoilage, an opened container can be recontaminated by sugar-tolerant mould. Also, high temperatures during preparation or subsequent storage reduced quality. Ultimately Maillard darkening and off flavour development occurred. Very delicate fruits make acceptable jelly, but the flavour is far removed from the fresh or gently processed juice product. Low calorie jelly is even more difficult to manufacture and store. Low methoxy pectin and calcium salts or other gel systems that are not dependent upon high sugar level provide adequate gel set. However, such systems are more susceptible to post process contamination and require refrigeration after opening. Fruit juice, particularly grape, is closely associated with wine. Indeed, wine was originally spoiled fruit juice that over the millennia was appreciated and perfected long before juices were refined. Actually, the technical and lay literature devoted to wine far exceeds the total treatment of all juices and similar beverages combined. Wine is briefly mentioned here since it represents a high value added product from fruits and also a step in the manufacture of vinegar, a logical by-product of juice manufacture. Crushed fruit or freshly expressed juice/puree is one step away from wine. The biquitous presence of all types of microbes, the sugar and nutrient content of fruits and generally low pH provides an ideal environment for "something" to grow. Airborne, that something will no doubt be mould, with an unsightly mass of mycelia and offensive odours. However, below the surface where oxygen is limited, yeast growth is likely, resulting in the production of ethyl alcohol and carbon dioxide gas. The classic Gay-Lussac equation is an over simplified but stociometrically reasonable depiction of the transformation of fermentable fruit sugars to ethanol and CO2 (Figure 8.11). Figure 8.11: The Gay-Lussac equation. Figure 8.12: Fruit wine flowchart. Rarely is the fruit composition ideal for wine. Certain grape cultivars under specific cultivation and climatic conditions are the exception. The crush or must usually requires sugar and/or acidity adjustment with or without added water. As with juice, imbalances in must acid or soluble solids are thereby corrected. A 10 to 13 percent alcohol (by volume, v/v) wine requires about 20 to 23 percent fermentable sugars and a pH of 3 to 4. The quality of properly made wine when held over time far exceeds juices. The extreme is fine wine, which may be many decades old. Nevertheless, storage at ~13ºC is ideal and most wines, particularly of fruit origin, should be consumed within several years. Fruit wines do not share the lofty image of certain fine wine grape cultivars. This is partially due to the several thousand year grape wine tradition, lack of experience with non grape wines and the more difficult manufacturing requirements. Highly acceptable wines can be made from practically all fruits, including exceptional ones in some cases. The most common quality defects of fruit wines are excessive sweetness and oxidized flavour and colour. Practice and attention to detail can easily avoid both. Of course, no food product, including fine aged wine is infinitely stable. Even under ideal storage conditions, deterioration of quality, which is mentioned in Chapter 4, is inevitable. Microbial contamination by lactobacillus can convert malic acid to lactic acid, reducing the acidity and changing the character, sometimes for the better. A more dramatic change is affected by Acetobacter, which can convert wine to vinegar in the presence of air. Fortunately, by excluding oxygen and maintaining low but significant SO2 levels (~50 ppm), incipient spoilage is easily avoided. 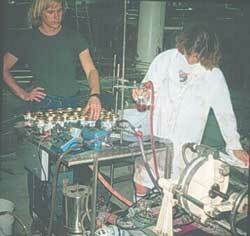 In fact, the vinegar fermentation is more difficult to initiate and control than wine making. Both products have their place in adding value to fruits. Oxidative changes are promoted in the absence of moisture with more reactive sites available for oxygen binding. Additional water molecules protect these sites. At higher moisture levels the above reactions dominate. For comparative purposes, single strength juices have Aws around 0.96; 72°Brix concentrates ~ 0.7; and dry, free-flowing juice powders ~ 0.2. The next step from concentrated juice is further removal of water to obtain a dry powder of less than 6 percent moisture. In the dry state ambient storage is possible, although low temperature still serves to extend storage life. Water is much easier to remove from fluids that can be pumped and manipulated through heat exchange and vapour removal systems. Mass and heat transfer becomes more of a challenge as the juice loses moisture and fluidity. There are a number of dehydration techniques applicable to juices (Table 8.5). For economic reasons most are based on some degree of juice concentration above single strength, generally as high as practical, given the flow characteristic and mechanical properties of the concentrated juice and design features of the dryer. Table 8.5: Juice dehydration systems. *All dry products are somewhat hygroscopic; protect from humid conditions. Fruit juices are not as easy to dry as protein or starch based foods. The high sugar content, consisting primarily of the reducing sugar, glucose and fructose, presents a problem. At low moisture levels the products are quite hygroscopic, readily picking up moisture from the air to become sticky and difficulty to manipulate. Dried fruit products, especially juices must be protected from the atmosphere during and after drying. An ideal drying room is maintained around 10 percent relative humidity. The dry product is then rapidly packed into a hermetically sealed moisture barrier material, either a bulk container or final package. Juice powder also presents a large surface area and is quite susceptible to oxidation without surface bound water to protect reactive sites (Figure 8.13). Rapid destruction of ascorbic acids and carotenoids occurs, unless oxygen is excluded during packaging. A nitrogen flush may help retain low oxygen conditions in the package, sometimes assisted by an internal oxygen-absorbing sachet or material built into the package inner surface (Section 8.3). Another difficulty is the sticky point of the dried juices. Even with little remaining moisture at high temperatures (greater than ~ 70ºC), the product will be in a glassy syrupy state and stick to machinery, vastly complicating materials handling. Malto-dextrans or other low dextrose equivalent (DE) corn syrups can reduce the sticky point, but then the juice powder is not pure. Means of overcoming these limitations are described for distinct types of drying. Nevertheless, equipment modifications and more demanding product handling procedures are required to overcome stickiness and the hygroscopic nature of dehydrated juices. The simplest dry product is fruit leather or fruit rolls, obtained by air drying a thin layer of juice, pulp, or concentrate on a flat surface (Figure 8.14). Gentle low temperature drying in a pan yields a plastic, sticky sheet about 1 to 3 mm thick of the original product containing less than 15 percent moisture. Depending upon the sugar profile, temperature and ambient humidity, the leather will range from slightly to moderately sticky to the touch. Sucrose, low dextrose equivalent (DE) corn syrup or other humectants (glycerol and other sugar alcohols) can be added to reduce the hygroscopic nature. Increasing pulp content provides chewiness to the roll. Ideal moisture content is around 12 percent; over 18 percent the sheet can support mould growth and below about 10 percent the sheet is too brittle. Figure 8.14 Fruit leather from juice puree. As in evaporation processes, the juices can be dehydrated under vacuum to reduce drying temperature and enhance quality. Continuous and batch systems are in operation. For economy and quality reasons, the juice is usually concentrated prior to vacuum drying. If the consistency is thick enough the concentrate can be puffed by applying rapid vacuum and maintained in this state to produce a puff-dried solid. The puffing produces an expanded surface area that facilitates moisture diffusion. Foam mat drying accomplishes the same effect without vacuum (Abd-Karim and Chee-Wai, 1999). A foaming agent is added to the concentrate with whipping to produce heat stable foam. Gentle air-drying results in dry foam. A continuous system applying a foam mat and blowing holes in the mat prior to drying has been developed. The puff or foam mat dried material is then ground to a readily reconstitutable powder. Foam drying has the advantage of using simple air drying, but the disadvantage of producing a large volume of foam to obtain a relatively small amount of dried juice powder, requiring protection from ambient humidity. The more efficient high throughput air dehydration techniques such as spray drying and drum drying are marginally applicable to juices. Aside from adding malto-dextrans, a spray-drying pattern must be designed so that the juice spray dries and is cooled below the sticky point before the particle hits the dryer wall and enter the collection system. A circuitous flow pattern and the introduction of a cooling zone accomplish this. The cool, dry particles do not stick but flow and are packaged as a powder. 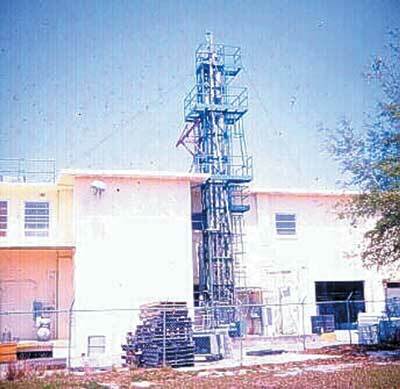 Another system employs a high tower in which spray dried material at the top has sufficient time to drift downward and cool before hitting a surface. Drum drying employing a hot roll rotating in the fluid or fed from between rollers. 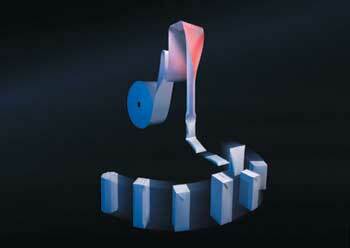 The film adhering to the roller surface is rapidly dried as it rotates out of the feed tank. Although the dried juice is in the glassy, sticky state, cooling and grinding under low humidity produces a juice powder. 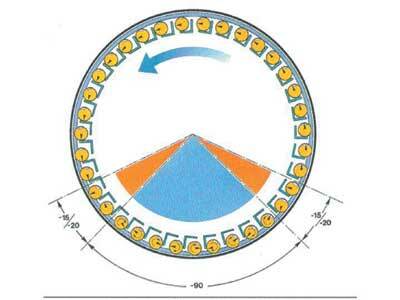 Vacuum drum drying in which the dryer in enclosed in a vacuum chamber can reduce heat exposure and affect a puffing of the juice on the drum. The gentlest and most expensive dehydration method is freeze-drying. The juice or concentrate (at about 50 ºBrix, the highest practical to maintain the frozen state) is applied to the belt, the vacuum puffs the juice slightly and it is then frozen and subjected to a vacuum well below the triple point of water, 4.6mm. Heat, applied by conduction from the shelf, infra-red radiation, or even microwave results in sublimation of the water in the frozen juice to vapour which refreezes on a condenser coil in the dryer. Since the juice never thaws, it dries as a porous sheet with minimal exposure to high temperature (Figure 8.15a. and 15b.). If the vacuum is replaced by nitrogen gas and the dried juice layer is ground, transferred and packed hermetically under low humidity and oxygen pressure, optimum quality results. 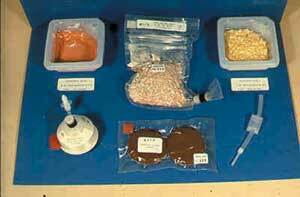 Foods for astronauts (space food rations, including juices) are often freeze dried to reduce precious weight and volume. The freeze-dried juice is compressed to reduce volume and packaged under inert atmosphere in a pouch that is oxygen and moisture impermeable and designed to facilitate rehydration. The juice is rehydrated by injecting into the pouch water generated from the fuel cell reaction of hydrogen and oxygen, so the water "paid its way" into space (Figure 8.16). Freeze-dried juices are extremely expensive, since water removal costs exceeds US$2/Kg of water removed. The process is quite functional for military, space and backpacking applications where saving weight and space is so critical. With adequate protection from high temperatures, moisture and oxygen reconstituted juice quality is high and a shelf life of several years or more can be accomplished. Figure 8.15a and b: Continuous freeze-dryer and flowchart. 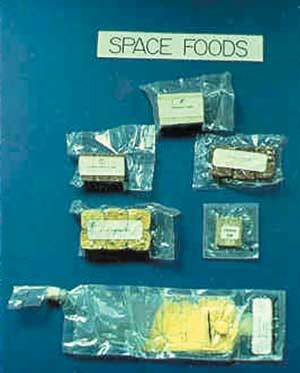 Figure 8.16: Freeze-dried space foods. Dehydrated juice in dispensers, lower left and bottom. Ever since early humans gathered semi-solid or liquid provisions, the problem of transporting and storing fluids has needed to be addressed. In clever adaptations to environmentally available materials the problem has been solved, first with animal skins/entrails and tightly woven or shaped/carved plant matter, then by industrial manufacture, i.e. pottery, glass, metal (Figure 1.1). Table 8.6 indicates the evolution and characteristics of some juice packaging materials and Table 8.7 the important functions provided. Parallel with the development of juice processing systems has been accompanying advances in packaging technology. The 3 piece can and glass-canning jar can be replaced in some applications with 2 piece aluminium cans, light weigh shock resistant glass, plastic and laminate materials. 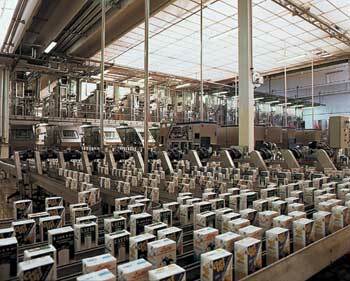 All facilitate greater efficiencies such as rapid throughput, product protection, lower cost and consumer convenience. Table 8.8 lists some juice packaging alternatives. Table 8.6: Juice packaging alternatives. Table 8.7: The role of food packaging. Table 8.8: Juice packaging options. The impermeable and inert nature of glass, combined with transparency makes it the package of choice for sales appeal and upper price beverage packaging (Brody and Lord, 2000). Although brittle and relatively heavy, glass containers have visual appeal and reuse potential. Technical innovation has greatly reduced wall thickness, weight and thermal shock susceptibility. Nevertheless, hot filled or processed glass must be carefully cooled to prevent shattering. Brown and green tints limit light sensitive reactions in the product. 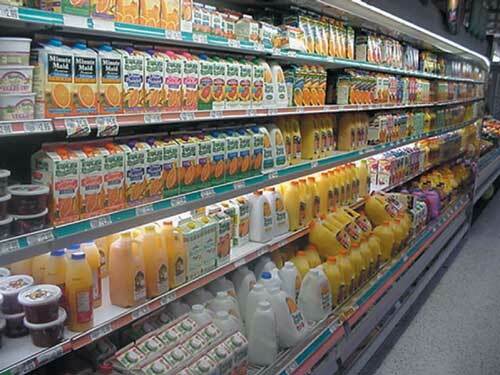 However, the visual quality of some juices dictates a clear wall, at the expense of light-induced deterioration for shelf stable, pasteurized products. 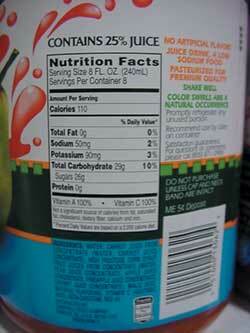 These same pasteurized juices are found in metal cans. Initially tin plated steel with or without enamel linings was used. In some cases the tin contributed an expected flavour, otherwise, the enamel protected the tin from contacting the juice. Enamels consisting of vinyls and epoxies protected the tin or tin free steel inner surface. Enamel-lined aluminium cans, due to lightweight and ease of manufacture, are replacing tin coatings. Despite rugged enamels, some juices blends and products containing nitrates or SO2 are highly corrosive, so care must be taken to establish liner/product compatibility under realistic storage conditions. Three-piece tin plate cans from 200 to 1 300 ml are still in use for juices, but increasingly, PET (polyethylene terephalate polyester) bottles predominate in retail markets (Figure 8.17). There is currently rough price parity between glass and PET container. Energy costs are higher for glass and raw materials costs more for plastic, although PET has an edge for larger containers. Moreover, recent technological innovations, such as the incorporation of acetylene gas into PET and polyethylene naphthalate (PEN) or PEN-PET blend and copolymers promise enhanced barrier properties, light protection and printability (C and E News, 2000). 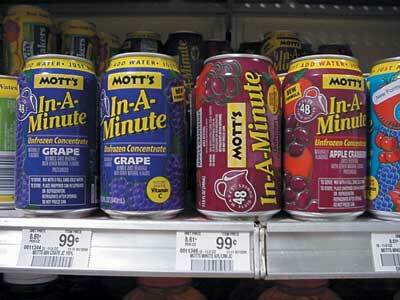 Figure 8.17: Aisle of "New Age" juice beverage containers. 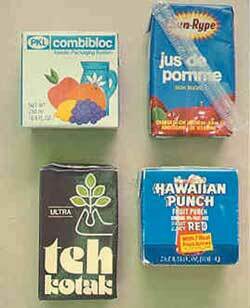 package and seal the juice in segments of tetrahedral or rectangular shape (Figure 8.18, Tetra Pak, 2000). Sterile filtered juice can be handled similarly. Aseptic cartons consist of about 70 percent paper, providing strength and form; 25 percent low density polyethylene, for sealing and moisture barrier; and 5 percent aluminium foil, as the light and oxygen barrier. 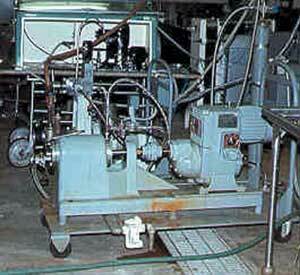 Container roll stock is sterilized during the forming step by hot hydrogen peroxide (Taylor, 1999). Retail packs of 250 ml include a plastic straw and orifice space for puncturing by the straw's point (Figure 8.19). (This latter feature is unpopular with parents and school officials, since a full container with straw inserted makes an instant squirt gun for children.) Easy open features are employed in all sizes from 150 ml to multi-litre containers. Since there are plastic containers capable of withstanding pasteurization temperatures available, hot fill or post fill pasteurization is now common. However, in regions where such technology is impractical, juices are filled into all types of inexpensive plastics, including unpasteurized fresh juice, juice beverages and imitations in polyethylene bags for immediate consumption. When dosed with high levels of benzoates shelf life is extended at the expense of content quality. Figure 8.18: Juice packaging retail options. Figure 8.19: Retail aseptic juice packs. Uniformity of bulk packaging - In the handling of pallets from shipping to retail the size and shape of over wraps is critical. Some shippers and retailers now demand standardization (moving toward uniform metric dimensions in the United States of America). This facilitates mixed pallet loads, loading and unloading of cartons and display case set up. In juices treated by any of the fore mentioned processes that destroy, remove, or inhibit microbes, there is still the potential for deterioration. This can take the form of intrinsic spoilage due to juice constituents or extrinsic induced by the environment. If residual enzyme activity remains (unpasteurized, sterile filtered or preservative treated), colour, flavour and consistency changes can occur. Extrinsic changes can be minimized, if not prevented by proper packaging. Juice protected from oxygen, heavy metals and light is quite stable, except from the most unavoidable deterioration, a combination of the intrinsic such as juice chemistry, the Maillard reaction and the extrinsic such as elevated storage temperature. Sugar-amine browning accompanied by other degradations occurs slowly at ambient temperatures (20 to 25ºC) but rapidly above ~30ºC. In warm climates or under exposure to improper storage conditions, juices deteriorate within a few days. A closed truck sitting in the sun easily reaches 50ºC, to the detriment of any food material inside. The incorporation of oxygen absorbing, metal chelating, or antimicrobial agents as an insert or built into the packaging material is an effective strategy (Rooney, 1995; Vermeiren, et al., 1999; Brody, et al., 2001). Although of greatest value in respiring fresh produce, employing "active packaging" can protect food and minimize or retard inevitable deteriorations; another example of the hurdle principle in action. One important role of packaging is to provide information (Table 8.7). Traditionally a label was required for the consumer, but the manufacturer and all others in the distribution chain, including retail sales need now identifying data. The introduction of the Universal Product Code (UPC), those small bar code strips (Figure 8.20) affixed to most retail (and many wholesale) items from food to machine screws and laser scanned at checkout counters, has revolutionized marketing. Figure 8.20: Beverage labels and bar codes for laser scanning. Along with price identification, UPC provided almost instantaneous information on sales location and volume, inventory and details relating to promotion, pricing and competitive products. The next generation promises even more information-rich devices and ease of use. Smart Packaging (e-PC) employs a packaging tag either emitting a radio frequency or having an electromagnetic charge for remote sensing, with orders of magnitude more information storage capacity of value to all in the juice distribution chain from fruit grower to juice consumer and even beyond to the package recycler. Juice manufacture and utilization logistics dictate that vast quantities of juices must often be seasonally held and/or transported long distances. The product must be completely stabilized for such handling. In the case of single strength or low Brix concentrates capable of tolerating thermal processing, aseptic processing is one alternative. 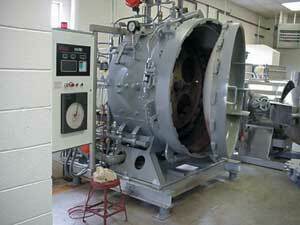 Under aseptic high temperature-short time (HTST) processing conditions heat damage is minimum. Provided that the system down stream from the pasteurizer is sterile, including cooler, filler and container, many hundreds to thousands of litres can be processed, transported and held effectively (Figures 8.6, 8.19 and 8.21). 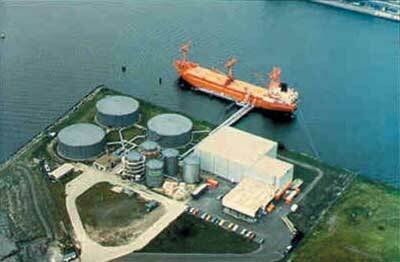 Figure 8.21: Citrus tanker and tank farm.The ultimate bulk packages. Under reasonable sanitary conditions, for instance low microbial load, juices can be maintained at low temperature in a carbon dioxide atmosphere (Konja and Lovric, Nagy, et al., 1993). High CO2 pressure is more effective, but required reinforced storage tanks. For more delicate products, single strength juice can be frozen practically unchanged, except for the expense and efforts required to freeze, store and eventually thaw large volumes of juice. Deaeration and rapid handling minimize enzymatic deterioration. (Although careful freezing, holding and thawing essentially maintain fresh juice character, it cannot be labelled "fresh" but can be "not from concentrate".) 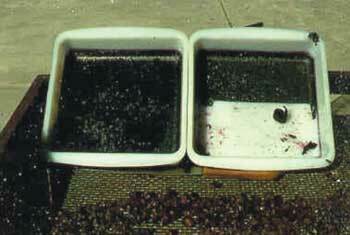 Frozen concentrate at 68 to 72 ºBrix held at less than -20ºC is widely practiced. The product can be warmed slightly for pumping and has a lengthy storage life. Freezing and storage requirements are proportionately less than for single strength or low Brix concentrates. Since bulk storage at cool temperature is costly, inventory control and utilization scheduling are important to minimize holding time. However, bulk storage can be a useful hedge against crop shortages and/or fruit price fluctuations (Figure 8.21).